Have you received advice that you or your child may have a mild variant of Ectodermal Dysplasia? This section is to help you understand the difference between having a mild variant and having a more severe form. The number and severity of signs and symptoms of Ectodermal Dysplasia can vary widely. However, where these are mild the condition is sometimes described as a mild variant form of Ectodermal Dysplasia. Often this is prompted by a severe dental problem with many missing, misshapen or conical teeth, but otherwise with very few or very mild features of an ectodermal dysplasia apparent elsewhere in the body. What are the typical characteristics of a mild variant of Ectodermal Dysplasia? The nails may be normal, flat, thin, soft, splitting, slow-growing, brittle and spoon-shaped (koilonychia). In rare cases, the nails may spontaneously separate from the nail beds or are absent at birth but start to grow later in childhood. Toenails may be more severely affected than the fingernails and may be differently affected in the same patient. The skin may be dry, pale and transparent. There may be a lack of temperature control such as lack of sweating (hypohidrosis) or excess sweating (hyperhidrosis). People with a mild variant of Ectodermal Dysplasia may have absent, widely spaced, or cone-shaped teeth with narrow crowns. The permanent teeth that are most commonly missing in this condition are the second premolars in the lower jaw, and the smaller (second or lateral) incisors and second premolars in the top jaw. Primary (deciduous or ‘baby’) teeth may also be absent although this is much less common than in the permanent dentition. 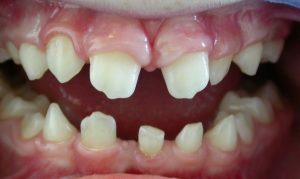 Whilst primary teeth are often normal, the Dentist may suspect Ectodermal Dysplasia when some of the secondary teeth fail to erupt. Lack of the “typical” facial features of the more common Ectodermal Dysplasia syndromes such as X-Linked Hypohidrotic Ectodermal Dysplasia, Haywells (AEC), EEC, Rapp Hodgkins, etc. In some cases, mild variant form of Ectodermal Dysplasia may be suspected at birth if one or more toenails and/or fingernails are absent. More commonly, the disorder is detected at approximately four or five years of age, when the absence of certain primary (deciduous) teeth and underdevelopment (hypoplasia) of nails may be noted. In some cases, a diagnosis of mild variant form of Ectodermal Dysplasia may not be confirmed until approximately 7 to 15 years of age, when absence and malformation of several secondary (permanent) teeth and nail dysplasia has been verified. A diagnosis of mild variant form of Ectodermal Dysplasia is confirmed based upon a thorough clinical evaluation and the identification of characteristic physical findings. What causes a mild variant Ectodermal Dysplasia? A mild variant of Ectodermal Dysplasia is thought to be related to changes in the known Ectodermal Dysplasia genes, the EDA, EDAR, EDARADD and WNT10A genes. Can a mild variant Ectodermal Dysplasia be inherited? Mild variant Ectodermal Dysplasia can be inherited in an autosomal recessive, autosomal dominant and X-linked pattern (see Genetic Inheritance section). Will a mild variant for of Ectodermal Dysplasia be worse in my children? It would be unusual for an individual with mild variant Ectodermal Dysplasia to develop more severe symptoms later in life. However, if an Ectodermal Dysplasia is mild in one family member, it may be less or more severe in their offspring. This partly depends on which gene change is responsible for the mild variant, but even when the molecular change is known it can be very difficult to predict how many problems a baby that inherited the gene change would experience due to the influence of all the other genes a baby inherits. Most general doctors and dentists will not be familiar with these conditions. If the dental problem is severe, you should seek a referral from your GP or Dentist to a hospital-based dental service for advice. A list of specialist clinics in your area can be obtained from the ED Society. Will a mild variant form of Ectodermal Dysplasia be worse in my children? There is often variability in how the same genetic alteration affects different individuals, even in the same family. This can be especially important if it is a woman who has mild features of Hypohidrotic Ectodermal Dysplasia and she has an affected son, because she may be a female carrier of the X-Linked Hypohidrotic Ectodermal Dysplasia who happens to show a few signs. In that case, an affected son might be fully affected by the condition. If a person has a mild variant of Ectodermal Dysplasia and is planning a family, they should seek advice about their chance of having a baby with mild variant form of Ectodermal Dysplasia. If there is a significant chance that the baby will be affected, the most important thing that they can tell doctors, midwives and nurses is that their baby may have difficulty staying cool by sweating. The ED Society has an information leaflet regarding newborns which will be helpful to the medical professionals taking care of you and your baby.